When you see something that says it has 2000 calories and you are female, you might just run away screaming from it, because you just KNOW its all going straight to your thighs 😛 But when it promises you 2000 calories on your lashes… ah! that’s a different story altogether, if you have skinny lashes. I’d read a lot about the Max Factor 200 Calorie Mascara on so many forums where girls raved on about how wonderful it was for their lashes. So, when I came across the Max Factor counter in Hong Kong, I knew I had to pick this up, and I did. The Max Factor 2000 Calorie Mascara is a mascara that promises to be everything a mascara should be – smudge proof, volumizing & lengthening. Does it? My answer is that this is one product that under-delivers in my view. The texture of the Max Factor 2000 Calorie mascara in the tube I got was rather dry. I’m not sure if this is the way the formula is, because my tube was brand new and sealed. That said, I did not find it goopy so it applied fairly well. I find the brush rather like a Maybelline mascara brush – big. Too big for my little lashes but perhaps due to the shape, it bothered me less than Maybelline mascara brushes do. Applied on my curled lashes, I found that it added some definition. After all, I was applying something on my lashes so of course there was a difference. However, it is not a va-va-voom difference. More of a “ooh, lashes” difference. What it did was make my rather skimpy lashes look fatter and more prominent but did not add much length or drastic volume. It is smudge proof and water resistent to a degree. When you cry with mascara on, you usually expect to find yourself looking rather like a panda or at worst a scary harlequin but nope, I still looked relatively normal. So, I’d say the Max Factor 2000 Calorie mascara is a good everyday basic mascara but not one for days when you want to glam it up or draw attention to your eyes. In fact, while wearing this mascara, I was asked if I’d forgotten my mascara for that day which tells you 2 things – one, my lashes aren’t long enough naturally, and two, the people around me are used to me wearing more dramatic looking mascara! I purchased this mascara for HKD68 (Approx: RM34) Not terribly expensive but because of my experience with it, not something I’d buy again. Its not available in Malaysia at this point in time. I tried this one out and was fairly disappointed. It was dry too, which I didn’t understand why, as it was sealed. Hey just like yours! Hmm. Anyways, the dry brush didn’t coat my lashes well, and certainly gave me no volume. ‘Tis a pity too, since it worked for so many people. 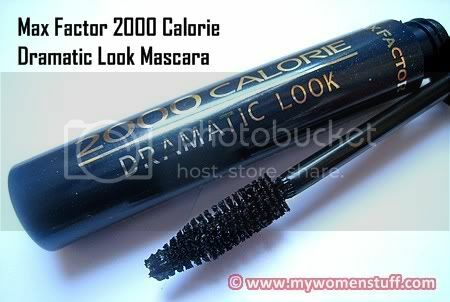 oh, thought max factor always gives good mascara (volume and length)..
i will not try this one. oh man…!! my 2000 calorie mascara is in delivery 🙁 I had such high hopes for it despite the brush. dang it! Oh well, that gives me a reason to pick up another Rimmel mascara :p I’ve been resisting because I was expecting max factor to arrive. I’ve been using Maybelline mascaras for years. I’ve used Bourjois in the past but the one I like isn’t available in waterproof. I use mascara everyday and I prefer getting drugstore brands because I bin them every 2 months. I’m looking to try a new brand – waterproof, smudge proof and volume. I’m off to read the rest of your reviews on mascaras. Thanks for the review. I like mascara that give lots of volume and lenght as my lashes are quite short, so I will skip this. @Nikki : For me, Anna Sui DX Full does this Vavavoom thing as does Guerlain Le 2 Mascara. Unfortunately both are high end. @Tine: Ah! I really don’t understand the dry bit either! @akiki : It might work for you though coz many people love it and many people can’t all be wrong! @Wendy: As I said, it didn’t work for me, but it might for you. @Amanda : Maybelline doesn’t work for me – pity. I am now using mascara nearly everyday too. So far, the best ones I’ve tried are the higher priced ones – Lancome, Anna Sui and Guerlain le 2. Ouch on the pocket! @prettybeautiful: It is! But it doesn’t smudge me as badly. this was my HG mascara for a lonnngg time, until my brother moved away from the US and i couldnt get it anymore 🙁 you’re right, it doesn’t lengthen much, but it’s good for thickening and also layers quite well. so if you have naturally long lashes and you want some volume, i think this is a good and pretty cheap way to go, if you can get it. @Jooj : Yes I have no quarrel with volume but it just lacked oomph for me. Very good for everyday though. Skincare Tip: The 13 dot technique has transformed the way I apply moisturizer and I love how my skin feels!